The Uranium One bribery scandal occurred when Obama Secretary of State Hillary Clinton gave approval to a deal that allowed a Russian government enterprise to control one-fifth of all uranium producing capacity in the United States. Rosatom, the Russian company, acquired Uranium One, an American firm owned by Canadian Frank Giustra (pron. Ju-stra). Giustra is a Friend of Bill (FOB) and member of the Clinton Foundation Board. With the purchase of Uranium One, Rosatom also bought the uranium exploration rights in Arizona, Colorado, and Utah. The Clinton's personally received $500,000 from the Russian Bank which financed the sale. In April 2018 a criminal referral was made for former Obama era Attorney General Loretta Lynch who threatened an FBI informant who tried to come forward with information in 2016. In 1991 the Russian Federation inherited the nuclear programs of the former Soviet Union. The Russian State Atomic Energy Corporation (Rosatom) is the successor agency to the Soviet state nuclear agencies. Rosatom is aggressively pursuing export contracts throughout the world with its business model of “Build-Own-Operate” (BOO). Rosatom offers to attend to all aspects of construction and operation of a nuclear project. Theoretically, this model would allow a nation to become a nuclear state even though it has little to no knowledge and infrastructure in place to support operation and oversight of a nuclear reactor. The model increases the client's dependency on Rosatom to operate the reactor, as well as its dependency on imported uranium. Russia's main exports throughout the Cold War were AK-47s and T-62 tanks. When Hitler invaded in mid 1941 Russia was unprepared, and spent the entirety of World War II bringing its weapons manufacturing capacity up to strength. When the Second World War ended, Soviet arms production didn't stop. For the next half century only a portion of Soviet manufacturing was ever converted to the peacetime domestic production of consumer goods. The end of the Cold War brought a pledge from the new Russian leaders to end the declaration of worldwide Marxist revolution and the export of AK-47s, in exchange for membership in the IMF and G8, and access to World Bank loans. Uranium is the one viable clean energy source that does not create carbon emissions. By 2014 Russia controlled 60% of the world's uranium supply and half of all enrichment capacity. Energy was one export commodity Russia had to integrate itself into the global trading system. Along with its crude oil and natural gas reserves Russia has set the goal for itself to become the world's energy power house. The American firm Westinghouse along with French and Japanese companies are Rosatom's only competitors. Rosatom has pursued various contracts to provide reactors in China, India, Iran, Turkey, Belarus, Armenia, Finland, Hungary, the UK, Bangladesh, Vietnam, Cape Verde, Namibia, Tunisia, Morocco, Brazil and Uruguay. Rosatom additionally has contracts in Sweden, the Netherlands, Belgium, Germany, France, Spain, the Czech Republic, Slovakia, Lithuania, Bulgaria, Slovenia, Libya, Algeria, Egypt, Jordan, Venezuela, Argentina, South Africa, Tanzania, Japan, South Korea, Mongolia, Australia, Canada, Mexico and the US. Disposal of nuclear waste is the most problematic issue facing the nuclear industry beyond the problem of proliferation. Rosatom has opted to reprocess highly radioactive spent fuel from its foreign plants. The radioactive waste must be cooled onsite for years before it can be transported. The transport of waste itself puts communities along the route at risk, and the final reprocessing generates an even greater volume of radioactive wastes. Reprocessing has been rejected in some nations, such as the United States. Reprocessing increases the volume of radioactive wastes and is a direct pathway to the production of separated weapons grade plutonium. Blending, on the other hand, is the recycling of nuclear weapons material into nuclear fuel for power plants. In 1992, the United States and Russia signed the HEU-LEU treaty (also called "Megatons into Megawatts"), in which highly enriched uranium extracted from disassembled Russian warheads was blended into low-enriched uranium and sent to American nuclear power plants. In coming years the program fueled ten percent of U.S. electricity. Tenex (Techsnabexport) is the Rosatom subsidiary responsible for the sale and transportation of this uranium to the United States. Tenex maintained its presence in the United States under the name Tenam, established about October 2010, based in Bethesda MD. The HEU-LEU contract worth more than $13 billion terminated in 2013. Vadim Mikerin was a Director of the Pan American Department of Tenex from about 2004 through about 2010, and was the President of Tenam from about October 2010 through about October 2014. Tenam serviced 19 contracts, directly and indirectly, with 12 American energy companies. As Tenam's director Mikerin had tremendous leverage over American companies in an extortion scheme that awarded contracts to transport uranium in exchange for kick-backs. Between 2004 and October 2014, Mikerin conspired with others to transmit funds from Maryland and elsewhere in the United States to offshore shell company bank accounts located in Cyprus, Latvia, Switzerland and the Seychelles Island for the purpose of promoting a corrupt payment scheme that violated the Foreign Corrupt Practices Act (FCPA). The payments were made to influence Mikerin and to secure improper business advantages for U.S. companies that did business with Tenex. Mikerin used consulting agreements and code words such as “lucky figure,” “LF,” “cake” and “remuneration” to disguise the corrupt payments. Mikerin pleaded guilty in 2014 “to helping orchestrate more than $2 million in bribe payments through a web of secret accounts in Cyprus, Latvia, and Switzerland.” His actions, according to the US government, occurred “with the consent of higher level officials at Tenex and Rosatom…”. Vadim Mikerin was sentenced for extortion and money laundering on Decenmber 15, 2015. Andrew McCabe was the investigating agent assigned to the case. Mueller's investigation was centered in Maryland, Tenam's home base. There, the U.S. attorney was Obama appointee Rod Rosenstein — now deputy attorney general, and the man who appointed Robert Mueller as special counsel to investigate President Trump. The Maryland District Court indictment of Mikerin and three others said that the FBI paid attention to suspicious financial transactions after a tip from a "confidential source" (in the indictment, he is called CS-1). Two friends of Mikerin and a person close to Rosatom believe that this is an employee of the American consulting company Sigma Transnational. CS-1 is now represented by prominent Washington DC attorney Victoria Toensing. Toensing said the FBI informed her client President Obama was briefed on the matter while the investigation was ongoing. In November 2017 CS-1 was identified as William J. Campbell. Sigma's website says its expertise in business and political consulting is based on 90 years of experience. The firm manages projects in a variety of fields, including energy and biotechnology, works with the US Department of Defense and provides advisory services to businesses related to nuclear materials and import-export operations. The Sigma website mentions that it provided services to Tenex and assisted Tenex in approving and completing contracts for $1.2 billion with 13 US companies. The "confidential source" told the FBI that he had a longtime acquaintance with Mikerin which was revived in 2003 thanks to a man from Florida, whose name is not disclosed. But the source believes that this man from Florida is associated with Russian and Eurasian "organized crime", the indictment says. In 2009, according to the prosecution, Mikerin askd CS-1 for kickbacks for the right to sign a contract with Tenex for lobbying and consulting services, as well as assistance in public relations for the Russian nuclear industry. These payments, according to CS-1, Mikerin called the "system" or "window". CS-1 was worried about this agreement and went to the FBI, where he was asked to continue to participate in the kickback scheme, giving the bureau all the information. He told everything in detail. According to CS-1's testimony the consulting company paid $460,000 as kickbacks. Moreover, the appetite of the recipients grew. For implementation of the first contract in 2009, Tenex was supposed to pay the consulting company $150,000 for three months, and Mikerin wanted a third of this sum as a kickback. Payments under the second contract were $550,000 for 11 months, and Mikerin required about half as a kickback. In 2011, Mikerin allegedly extended the contract for 11 months in the interests of Tenex. Mikerin was arrested on a complaint describing a racketeering scheme that stretched back to 2004 and included extortion, fraud, and money laundering. Money-laundering carries a penalty of up to 20 years’ imprisonment — not only for conspiracy but for each act of money laundering (at section 1956 of the penal code). But Mikerin was permitted to plead guilty to an offense charged under the catch-all federal conspiracy provision (section 371) that criminalizes agreements to commit any crime against the United States. Section 371 prescribes a sentence of zero to five years’ imprisonment. The plea agreement shows that the Obama DOJ's Fraud Section was then run by Andrew Weissmann, who is now one of the top prosecutors in Robert Mueller's special-counsel Trump-Russia investigation. Yet, that is exactly what Rosenstein's office did, in a plea agreement his prosecutors co-signed with attorneys from the Justice Department's Fraud Section. (See in The Hill’s report, the third document embedded at the bottom, titled “Mikerin Plea Deal.”) No RICO, no extortion, no fraud — and the plea agreement does not to mention any of the extortions in 2009 and 2010, before Committee on Foreign Investment in the US approved Rosatom's acquisition of Uranium One. Mikerin just plead guilty to a nominal “money laundering” conspiracy charge, insulating him from a longer sentence. Thus, he got a term of only four years’ for a major national security crime. Between 2008 and 2010, Uranium One and Former Ur-Asia investors donated $8.65 million to the Clinton Foundation. During this period of time, Uranium One's legal hold on the Kazakhstan-based uranium deposits was in doubt. Allegedly, Uranium One executives contacted U.S. Embassy officials in Kazakhstan to help ensure the validity of their mining licenses. According to the New York Times, the State Department cable explaining the circumstances was copied to Secretary Clinton, among other individuals. In 2009, when the validity of the mining licenses was at issue, the Chairman of Uranium One, Mr. Ian Telfer, donated $1 million to the Clinton Foundation via his family charity called the Fernwood Foundation. In the same year, ARMZ acquired a 17% state in Uranium One and the parties sought an initial CFIUS review. In June 2010, Rosatom, via ARMZ, sought majority ownership in Uranium One. According to news reports, Mr. Telfer donated $250,000 to the Clinton Foundation during this crucial time. In total, Mr. Telfer donated over $2 million through 2013. Bill Clinton helped his Canadian billionaire friend, Frank Giustra, obtain uranium-mining rights from Kazakhstan's dictator, Nursultan Nazarbayev. On September 6, 2005 the two flew aboard Giustra's private jet to Almaty, Kazakhstan, where they dined Nazarbayev. Clinton expressed support for Nazarbayev's bid to head the Organization for Security and Cooperation in Europe (OSCE) - an international elections monitoring group and supports democracy that would confer legitimacy on Nazarbayev corrupt regime. Clinton's public endorsement undercut Bush administration policy critical of Kazakhstan's poor human rights record. Even then Sen. Hillary Clinton was publicly critical of Nazarbayev's poor human rights record. As of 2015, Kazakhstan has never held an election meeting international standards. Within two days, Giustra's company, UrAsia Energy, signed a deal giving it stakes in three uranium mines controlled by the Kazakhstan's state-run uranium agency, Kazatomprom. The deal stunned the mining industry, turning an unknown shell company formed in Vancouver in late 2004 into one of the world's largest uranium producers in a transaction ultimately worth tens of millions of dollars to Giustra. Giustra and his partners thereafter contributed tens of millions of dollars to the Clinton Foundation. The cost of acquiring the Kazakh mines from Kazatomprom, which was responsible for 20% of world production, was more than $450 million, money UrAsia did not have in hand and had only weeks to come up with. The transaction was finalized in November 2005, after UrAsia raised the money through the largest initial public offering in the history of Canada's Venture Exchange. Other companies showed interest in the Kazakh mines for years but Kazatomprom's choice of UrAsia confounded lngtime market watchers. The company became a major uranium producer didn't even exist two years earlier. Giustra personally given over $25 million to the Clinton Foundation. In February 2007, a company called Uranium One agreed to pay $3.1 billion to acquire UrAsia. Giustra would be paid $7.05 per share for a company that just two years earlier was trading at 10 cents per share. The new company, which kept the Uranium One name, was controlled by UrAsia investors with Giustra becoming a major shareholder. Besides acquiring the Kazakh reserves, Uranium One also controlled about one fifth of the uranium reserves in the United States. In April 2007, Uranium One announced the purchase of a uranium mill in Utah and more than 38,000 acres of uranium-exploration properties in four Western states, followed quickly by the acquisition of Energy Metals and its uranium holdings in Wyoming, Texas and Utah. Vladimir Putin also wanted the Kazakh uranium and leaned on the Kazakhstan's dictator Nazarbayev, who promptly arrested Kazatomprom President Moukhtar Dzhakishev, the official responsible for selling the uranium mining rights to Giustra's company. This put Uranium One's stake in jeopardy of being seized by the Kazakh government. By June 2009, Uranium One's stock fell 40 percent. Uranium One's panicked executives turned to the US State Department, where Hillary Clinton was now in charge. The State Dept. convened emergency meetings with the Kazakh regime on June 10 and 11. Three days later, a subsidiary of Rosatom completed a deal for 17 percent of Uranium One. The threat of seizure of the Kazakh reserves disappeared, and Giustra's investment was safe. Within a year, the Russian government substantially upped the ante, with a generous offer to shareholders that would give it a 51 percent controlling stake. But first, Uranium One had to get the U.S. government to sign off on the deal. Before Hillary Clinton could assume her post as Secretary of State in 2009, the White House demanded that she sign a memorandum of understanding placing limits on Bill Clinton's foundation activities. To avoid the perception of conflicts of interest, beyond the ban on foreign government donations, the foundation was required to publicly disclose all contributors. None of the Uranium One shareholders donations were disclosed after the Rosatom approval. These donations to the Clinton Foundation totaled some $130 million. Under Canadian law the identity of donors to a non-profit entity are allowed anonymity. Giustra formed with Bill Clinton the Clinton Giustra Enterprise Partnership as part of the Clinton Foundation, which could receive anonymous donations. After the transfer of Uranium One to Rosatom, Giustra and others donated over $130 million to the Clinton Foundation. Evidence suggests the 33,000 emails Hillary Clinton admitted to destroying are related to the Uranium One bribery scandal. Tony Podesta's lobbying firm, the Podesta Group, represented the Russian-owned company Uranium One during former President Barack Obama's administration and did not register under the Foreign Agents Registration Act, The Daily Caller News Foundation has determined. 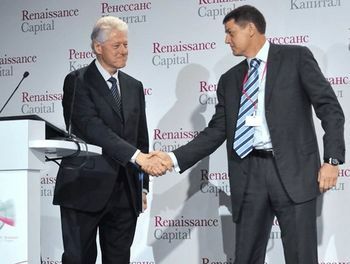 Bill Clinton lists Arkady Dvorkovich, a top aide to Russian President Dmitri Medvedev and a key Rosatom board member as one of 15 Russians he wanted to meet with. Rosatom is the parent company of Tenex, then under investigation by FBI Dir. Robert Mueller for money-laundering and extortion of American energy companies. Processing of Rosatom's request to purchase Uranium One was in the works by Hillary's State Dept. at the time. Carter Page is said to have met Dvorkovich about this time as well. Clinton met with Putin and Medvedev during the excursion to Moscow, where he received $500,000 from the bank financing the Rosatom-Uranium One purchase. APCO Worldwide, a global communications firm that lobbied on behalf of Rosatom and it's American subsidiary Tenex at the time of the Uranium One deal, vastly understated its support for the Clinton Global Initiative (CGI). The Hill discovered APCO provided hundreds of thousands of dollars in pro-bono services and in-kind contributions which APCO reported, but CGI did not. In the fall of 2011 APCO's lists in-kind contribution at $275,000, and the annual report submitted to the United Nations Global Compact, boasted “APCO significantly increased its pro-bono support for CGI and, for the first time, our team managed the press around CGI’s America meeting, as well as its global Annual Meeting." At the time APCO was paid $3 million by Rosatom, Russia's state-owned nuclear company. Rosatom paid APCO to lobby the State Department and other federal agencies on behalf of Tenex, which sought to increase uranium business inside federal agencies and Congress. APCO made more than 50 contacts with federal and congressional figures for Tenex, including at least 10 involving senior officials inside the Clinton State Department in 2010 and 2011. The contacts ranged from “promoting US-Russian civilian nuclear partnership” to attempts at freeing Russia from “anti-dumping” restrictions imposed on its uranium business. APCO Executive Director Kent Jarrell claimed the company had little contact with Vadim Mikerin, director of Tenex, who pleaded guilty in 2015 to a corruption charge stemming from the FBI bribery probe. Jarrell said APCO dealt mostly with Rosatom oligarchs, who also were subjects of the FBI's extortion and money-laundering investigation. The firm promoted a U.S. visit in 2011 by former Russian Prime Minister Sergey Kirienko, who then as the top official at Rosatom. Mikerin was tasked with forming Tenex's new American office called Tenam. APCO's lobbying records show the firm helped create a Web site for Tenam and a press release announcing the new American subsidiary. An invite list provided to the FBI by a confidential informant shows APCO executives attended the grand opening celebration of Tenam's office in suburban Washington in October 2010. APCO officials estimate their total cash donations to CGI totaled $45,600 and their in-kind support to CGI exceeded $1 million since 2008. They also acknowledged that the firm's pro-bono work increased significantly in 2011 while it worked for Tenex. Pro-bono work involved providing free media support to CGI for various events and activities as well as to the other non-governmental organizations that made charitable commitments under the Clinton brand. Hillary Clinton and staff considered at least one APCO lobbyist, former career ambassador Elizabeth Jones, for two top jobs. “At Friday's meeting, Hillary made clear Beth Jones was her first choice for Ambassador to Iraq. Since I don't know her, we agreed that I should meet with her today or tomorrow,” Defense Secretary Robert Gates wrote Clinton confidant John Podesta in a 2009 email. Clinton's top aides successfully vetted her in 2011 to become a special envoy for Pakistan and Afghanistan. Mikhail Khodorkovsky, along with Bill Browder, lobbied heavily for passage of the Magnitsky Act. Khodorkovsky did so through his Corbiere Trust, which handles Khodorkovsky's remaining fortune. It also lobbied for passage of Senate Resolution 322, which provided express support for Mikhail Khodorkovsky and Platon Lebedev. Between August 28 and September 3, 2015 an FBI agent sent notification to preserve records to the Nuclear Regulatory Commission; U.S. Dept. of Treasury; Office of Director of National Intelligence (ODNI James Clapper); National Counter Terrorism Center; and the U.S. Department of Energy (DoE), the National Security Agency (NSA – Admiral Mike Rogers) the United States Secret Service (USSS); the Central Intelligence Agency (CIA), Defense Intelligence Agency (DIA), and the Department of Defense in relation to Hillary Clinton email scandal. All these are member agencies of the Committee on Foreign Investment (CFIUS) necessary to approve the Uranium One deal. During these notifications on August 31 Vadim Mikerin was allowed to plead guilty to a lesser charge. The Department of Justice's National Security Division (NSD) reviewed this transaction in consultation with the Federal Bureau of Investigation (FBI) and CFIUS agencies. In accordance with standard procedure, NSD evaluated the factors listed in section 721 of the Defense Production Act of 1950, as amended, and ultimately communicated to CFIUS the Department's clearance of this transaction. ↑ https://www.caseyresearch.com/putins-colder-war/ It already controls a third of yellowcake-to-uranium-hexafluoride conversion. ↑ Eleven months before Mr. Clinton's statement, Mrs. Clinton co-signed a commission letter to the State Department that sounded "alarm bells" about the prospect that Kazakhstan might head the group. The letter stated that Kazakhstan's bid "would not be acceptable," citing "serious corruption," canceled elections and government control of the news media. Robert Herman, who worked for the State Department in the Clinton administration and is now at Freedom House, a human rights group, said the former president's statement amounted to an endorsement of Kazakhstan's readiness to lead the group, a position he called "patently absurd." "He was either going off his brief or he was sadly mistaken," Mr. Herman said. "There was nothing in the record to suggest that they really wanted to move forward on democratic reform." Indeed, in December 2005, Mr. Nazarbayev won another election, which the security organization itself said was marred by an "atmosphere of intimidation" and "ballot-box stuffing." After Mr. Nazarbayev won with 91 percent of the vote, Mr. Clinton sent his congratulations. "Recognizing that your work has received an excellent grade is one of the most important rewards in life," Mr. Clinton wrote in a letter released by the Kazakh embassy. Last September, just weeks after Kazakhstan held an election that once again failed to meet international standards, Mr. Clinton honored Mr. Nazarbayev by inviting him to his annual philanthropic conference. ↑ Records show that Mr. Giustra donated the $31.3 million to the Clinton Foundation in the months that followed in 2006, but neither he nor a spokesman for Mr. Clinton would say exactly when. In September 2006, Giustra co-produced a gala 60th birthday for Bill Clinton raised about $21 million for the Clinton Foundation. Giustra held a fundraiser for the Clinton Giustra Sustainable Growth Initiative, to which he had pledged $100 million. ↑ Kazatomprom's choice of UrAsia was a "mystery," said Gene Clark, the chief executive of Trade Tech, a uranium industry newsletter. ↑ The same month Moukhtar Dzhakishev, President of Kazatomprom said that he traveled to Chappaqua, New York to meet with Clinton at his home. Giustra arranged the meeting. The meeting occurred on February 27, 2007. Both Clinton and Giustra denied that any such meeting occurred. ↑ Ian Telfer, a Canadian, became chairman. ↑ In 2009 a Chinese effort to take over a Nevada good mine with a potential for minerals at the site, including uranium, was killed by the same Committee on Foreign Investment. This page was last modified on 9 April 2019, at 18:51.